In response to a Care2 petition signed by over 224,000 people asking the company to stop supporting NYBC, executives from Citigroup invited representatives from TheirTurn to brief them on the crisis and discuss possible ways in which they could help. Citigroup engaged with advocates and took action as a result of this petition and other grass roots tactics. In May, 2015, the NY Times reported that NYBC had “withdrawn all funding for them,” leaving the chimps to die of starvation and thirst. In order to keep the chimps alive, Liberians who had been employed by the blood center to deliver food and water, began to care for them on a volunteer basis. With virtually no resources and burdened by the Ebola outbreak in Liberia, these volunteers kept the chimpanzees alive until an HSUS-led coalition of over 30 animal conservation groups raised funds from the public to pay for the chimps’ care on an emergency basis — until NYBC reinstates funding. When the news broke in the Spring of 2015 about NYBC’s decision to abandon the chimps, thousands of grass roots activists worldwide began to mobilize – contacting NYBC, donating to the fund to pay for the chimps’ care; signing and circulating petitions; and participating in online actions organized by NYBC: Do The Right Thing. In New York City, home of the NY Blood Center’s headquarters, grass roots activists began staging protests in May. They are now turning their attention to the blood center’s corporate donors, the largest of which is MetLife. Citigroup’s bold decision to make a public statement about the chimps and generously provide much-needed funding for their care represents a big step forward for the chimps and the concerned citizens worldwide who have been advocating on their behalf. 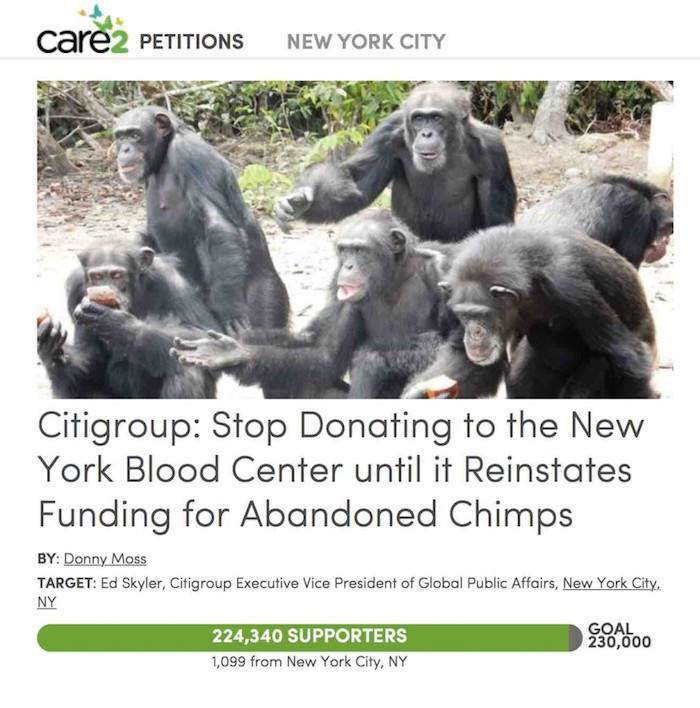 But the campaign is not – and will not – be over until the New York Blood Center fulfills its obligation – and promise – to provide lifelong care for their former lab chimpanzees. 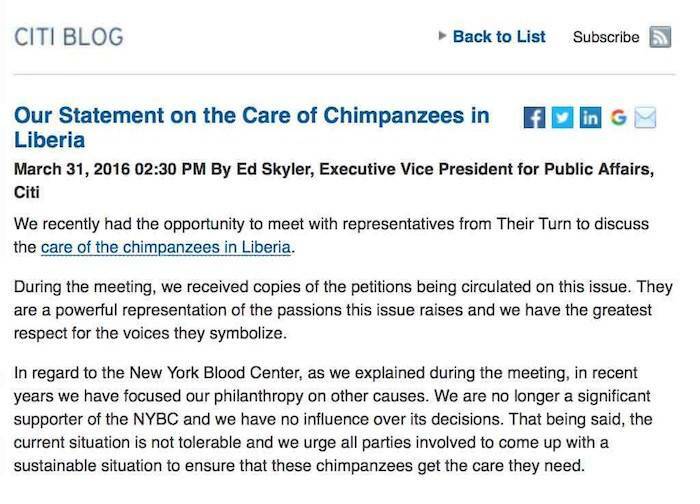 Please join the Facebook page: New York Blood Center: Do the Right Thing to stay apprised of news and to participate in online actions to pressure NYBC board members to fulfill their promise to provide lifelong care to their laboratory chimps.